Yahoo's reportedly ponying up $85 million for an upcoming ad campaign—nearly twice as much as they spent on advertising in all of 2009. 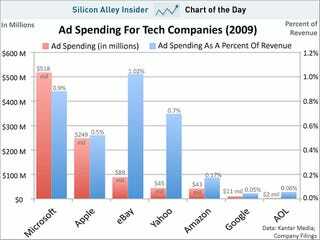 But as this chart shows, Yahoo's wager looks puny next to Microsoft's massive ad spending. According to Kantar Media, who provided Silicon Alley Insider with numbers for total ad spending (print, online, radio, tv, and outdoor), Microsoft spent some $518 million on advertising last year, over twice as much as Apple did, with $249 million. And I'm not entirely sure they got their money's worth—I'm having a hard time thinking of much recent Microsoft propaganda besides those "make a PC for under $1000" commercials, which basically seemed like Best Buy spots anyway. Update: also, this.